This is an officially licensed and pretty cool LED mood light inspired by Fallout video game series. The mood lamp measures 8-1/2 inches tall by 3-1/3 inches max diameter. As we can see from the images, it’s inspred by Nuka-Cola Quantum soda from the universe of Fallout video game series, so the rocket-shaped bottle delivers accurate contours and meticulous detailing from its original design. More importantly, the LED mood light shows off a bright blue glow, and unlike the original beverage that glows using mildly radioactive strontium isotope, the replica delivers a safer glow with built-in LED light. 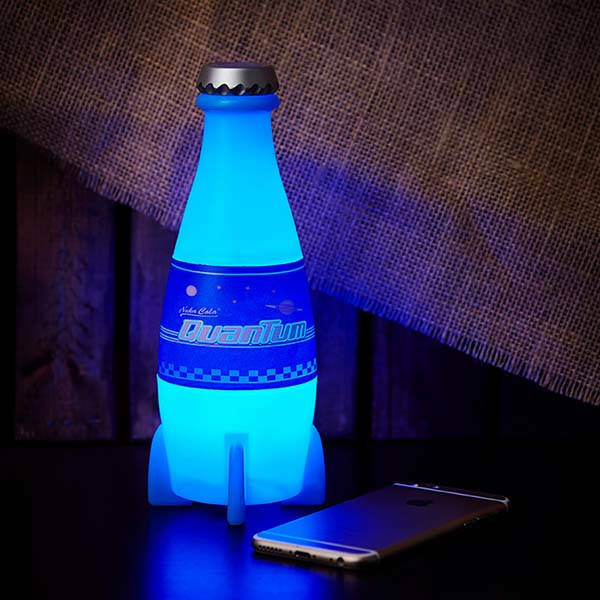 The Nuka-Cola Quantum LED mood light is injection molded for precision for disability, and it’s powered by 3 LR44 button cell batteries so that you can effortlessly place it anywhere in your house, and it shuts off after 10 minutes to preserve batteries. Moreover, using an included USB cable, it can also be powered via USB. The on/off switch on the base lets you control it with ease.